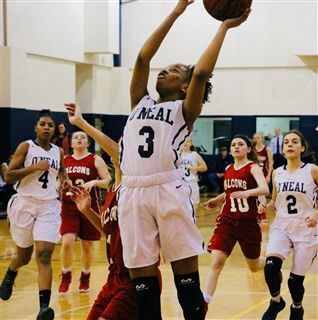 The O’Neal School’s girls’ basketball team heads into 2019 sitting at 10-1 overall and 2-0 in conference play. They have impressively outscored their opponents 604 to 311, thus far this season. This success has seen the Falcons climb the NCISAA 2A MaxPreps polls and enter 2019 as the #2 ranked team. 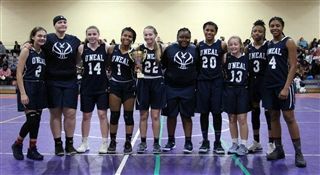 Under the guidance of veteran coach Lulu Brase, the 2018-19 season started on a feverish pace with the Falcons opening their season with a perfect 5-0 in November, including a strong win over state championship contender Wayne Country Day in the second game of the season. The game highlighted the Falcons’ depth and up-tempo style play. The Falcons continued its strong play through December and competed at the CRAZE Sports Holiday Invitation in Charlotte over the winter break. After a strong opening two rounds defeating both Mountain Island Charter and Garinger High School handily, the Falcons earned a match-up against #1 ranked Davidson Day, who knocked the Falcons out of last year’s NCISAA State Tournament, in the tournament championship game. In a nail biter, with the largest lead of the game only reaching 8 points by Davidson Day in the fourth quarter, both teams competed fiercely. Davidson Day strung together more stops in the final minutes of the game to win 51-47 over the Falcons. The loss was the first of the 2018-19 season for the Falcons, and moved them to 10-1, 2-0 in the season. The Falcons strong start to the year has been highlighted by freshman point guard Caelan McHarney. Now in her 3rd year as the team’s starting point guard. 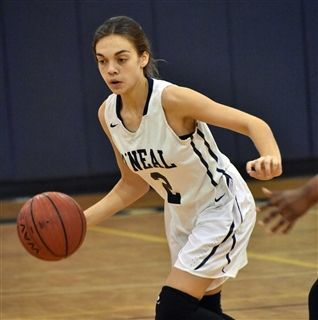 McHarney dictates the O’Neal high powered offense with strong precision, posting a team-high 4.5 assists per game. Leading the Falcon attack is junior Kei-Kei Love, who’s knock down shooting has her averaging 16.3 points per game this season. Senior guard Ralayah McRae has become the team’s lockdown defender and matches her defensive intensity with 9.8 points per game on the offensive end. Junior Hadiya Balser complements McRae’s and Kei-Kei Love’s scoring, averaging a double-double, with 10.1 points and 10.3 rebounds a game. She is only to be outmatched in the rebounding column by her younger sister, freshmen Aaliyah Balser, who grounds the Falcons defense with 11 rebounds a game. Rounding out the starting lineup, sophomore Kayla Jenkins has added a layer to the Falcon offense with her ability to run the floor, searching for jump shots in transition. The knock-down shooter stretches the defense and has become a strong threat within the Falcon transition offense. Adding depth to the Falcon roster, junior Rachel Patton provides strong leadership and a spark from the bench helping to unite the Falcons. 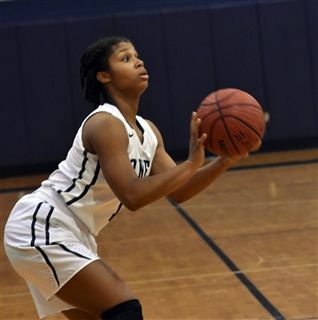 Joining Patton, sophomore Beka Carr brings depth in the back court with her relentless offensive rebounding. Freshmen Molly Haarlow and Talayah Baldwin round out the Falcon roster providing youthful energy and a bright future!